Some of you may think that I eat tofu and greens 24/7…but think again. While I do eat healthier than your average mama…I do have treats now and then. 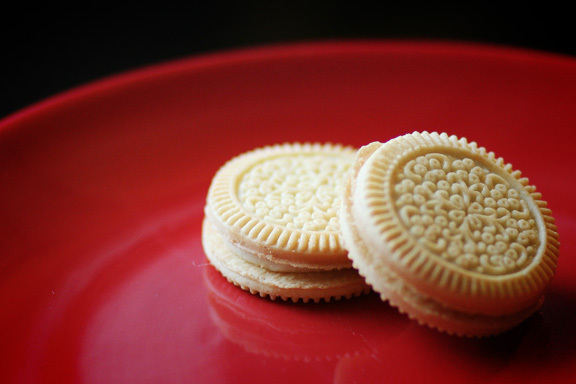 These little sandwich creme cookies are just too delicious to resist. Of course, I did put a little thought into it. They came from the natural food section. They are “natural” in the fact that they have REAL sugar in them instead of high fructose corn syrup. It doesn’t make them any better for me, but it’s a little easier for this ‘ol body to digest. I call these “church cookies” because they remind me of the cookies the little old ladies used to bring for fellowship time in the tiny lobby of my church growing up. I used to be soooo excited for church to get over so we could finally go have cookies!! I love it when I visit a church that puts out cookies (if there is coffee…that’s even better!). I’m there to feed my soul…but filling my tummy makes me happy too. Entry filed under: Cookies, Dessert. I knew the sweet tooth was still in there somewhere. 🙂 Eat a couple extra for me too. But only once a week.